4 wheelers in India: Is Maruti Ertiga a better MPV than Chevrolet Enjoy? Is Maruti Ertiga a better MPV than Chevrolet Enjoy? Well, it is difficult to answer this question as both the vehicles are different yet both are identical in many of the aspects. If we just take Chevrolet Enjoy for example, it is more spacious that offers much better seating arrangement compared to Ertiga. On the other side, Ertiga is a fuel efficient vehicle that also provides much better features inside. So, individuals will find it difficult to make out their mind while choosing one of these two vehicles. The most successful Maruti Ertiga is undoubtedly the best choice for individuals but considering the newly launched Chevrolet Enjoy will be helpful. 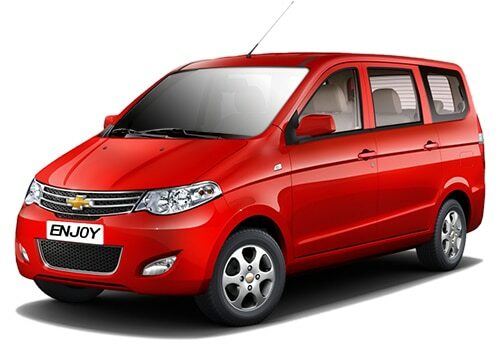 Chevrolet Enjoy from the fleet of Chevrolet Cars comes with better interior space and superior seating arrangement. However, its is not as stylish as Ertiga, which is a bit of disappointing aspect. In terms of features, it is equipped with decent features inside but its base version lacks many of the features. Maruti Ertiga on the other side is offered with a perfect combination of features that makes it a worthy to buy. Enjoy is purely targeted towards big Indian families who looks for spacious vehicles. It will be better to make a close comparison between both the vehicle, which will make you choose the right one. Both the vehicles are made available with 1.4 litre petrol and 1.3 litre diesel engine options while equipped with a 5 speed manual transmission gearbox option. If we just compare the diesel variants, Chevrolet enjoy is blessed with a 1.3 litre 4 cylinder SMARTECH 1248cc engine that churns out a power of about 77Bhp at 4000Rpm and makes 188Nm of torque at 1750Rpm. This vehicle offers a mileage of just about 18.2Kmpl, which is less than Ertiga. The all new diesel Chevrolet Enjoy price starts at Rs. 6.69 lakh (ex showroom price New Delhi). On the other side Maruti Ertiga is blessed with a 1.3 litre engine that has the ability to churn out 89Bhp of maximum power at 4000 Rpm and a torque of 200Nm at 1750-2500Rpm. It is being considered as the most fuel efficient vehicle in the segment as it offers about 20.7Kmpl of mileage. The diesel Maruti Ertiga price starts at just Rs. 7.40 lakh and it goes up to Rs. 8.71 lakh, which is more than the price of Enjoy but it is reasonable. Despite being and expensive MPV in the segment, Ertiga has much to offer for the individuals and families who chooses it. Moreover, it is a fuel efficient vehicle and more power and a reliable vehicle that certainly lives up to your expectations. It indeed has contributed for the sales of Maruti Cars in India, especially in MPV segment. Mahindra cars, the leading SUV manufacturer in India is currently working on the Mahindra Verito Vibe, a sub 4 meters hatchback that will make its official debut in the Indian market by next month.